Some weeks ago while taking a look at a Second Life University, I ran onto a Tresi Nonno (Pimiko Resident). She described herself as working on a "3-D anthropology" project, and offered to show it to me, taking me to Renzio (56/52/2107). There, I saw a small walled village. She described it as Ainu, saying she was one in real life. To those who don't know, Ainu are Japan's original inhabitants, living on the islands before the Japanese arrived. Today, they live mostly on the northern Japanese island of Hokkaido. Unmixed Ainu are lighter skinned than most Asians and have wavy hair, called by some "White Japanese," even though their origins are non-European. Estimates of their numbers vary. Tresi thought it was about 30,000. I asked her if it was sometimes difficult to explain to others what she was. She answered, "Yep, I see there is a huge mythology/stereotypes spread by weaboo that Japan = geisha/samurai/pokemon/anime/J-pop and so on. But ... here is (a) different Japan. Here is represented a settlement of Early Japan." She provided me to a post on her blog, "Early History of Japan." The viewer gave the description, "Yamatai Kartya Senta" (邪馬台国文化センター), or "Yamatai Cultural Center." Over the village flew a flag, looking like the "Rising sun" with rays seen in WW2, but black and white instead of red and white. There were a couple huts on logs accessable through planks, and a tower with a simple wood ladder leading up to the top. In the middle was a fire with several pillows around it, with a bear nearby. There were a few other things around such as a dugout canoe, fish drying on a rack, a couple pigs, and what could be a half-finished hut. On a board near the entrance was a book one could click on and download, "An Introduction Into Root Shinto." Talking to Tresi, she told me after first coming to Second Life, "I just spent time in clubs, explored SL and made new friends. Then after about 6 month I set up my own resort. It is now known as Ainu Resort." Rather than education, she told me the place was built to entertain, a "plain club/entertainment sim." Asking her when she got the idea for building the villiage, she told me she'd "always had this idea" since coming to SL, "and finally I decided to rent a new sim and realize it." She made it all at once in a matter of hours. While expanding the villiage was a possibility, she planned on getting the word out about it first, as well as writing, "right now I am quite busy with a journal in real life, but as soon as possible I am going to start writing a popular text on Yamatai civilization ... I would like to write not just 'light academic book' but the kind of book that could be (the) base of (a) roleplay. 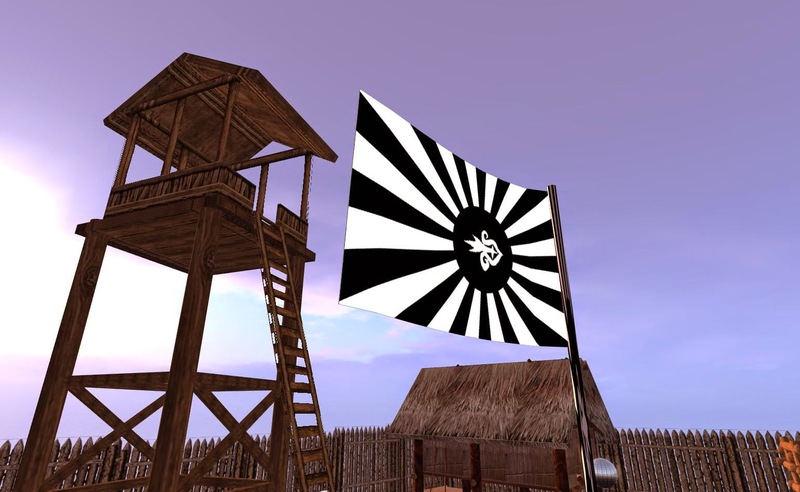 ... we all can see that certain people roleplay Edo themed ... it's OK but Japan history ain't restricted by Edo (laughter), and as for me it's quite weird that people haven't made any attempt to create anything else except Edo themed sims, even those who especially study (the) history of Japan. It's really weird. ... I do wonder why people's creativity is so restrcited by stereotypes, even in Second Life where anyone can set own space." We talked for a while, the conversation going about science in Second Life and the demand for it, in addition to how life on the Grid affects some people and what she felt were Linden Lab's shortcomings. But eventually we went out separate ways. 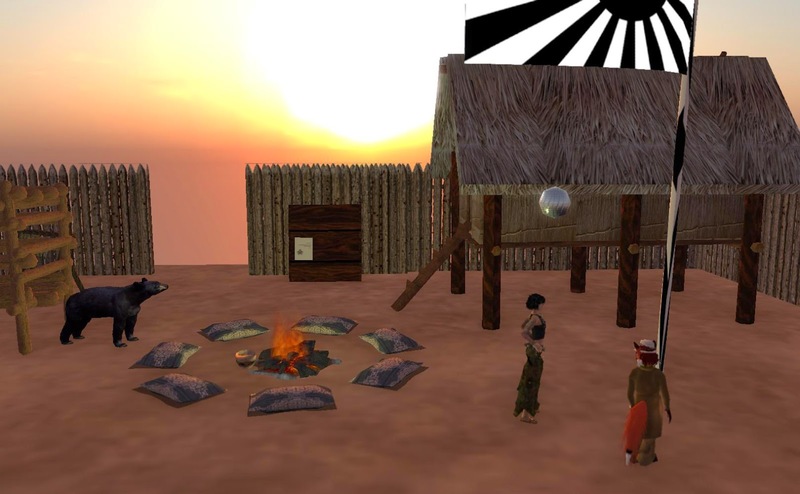 Tresi's village is at http://slurl.com/secondlife/Renzio/56/52/2107 . One can also look at her blog at http://tresi-nonno.blogspot.com, which is written in both English and Japanese.